It is observed in markets that when more price of commodities are offered to sellers. They increase the quantity supplied of these commodities and when the level of prices decreases, the sellers decrease the quantity supplied. This behavior of seller is called law of supply. "Other things remaining the same, if the price of a commodity increases its quantity supplied increases and if the price of a commodity decreases, quantity supplied also decreases". It assumed that there is no change in cost of production because of the profit decreases with the increase in cost of production and it causes the decrease in supply. If price of a commodity decreases and cost of production also decreases, at the same time, the quantity supplied does not decrease and profit remains constant. It is also assumed that technique of production does not change. If better methods of production are invented, profit increases at the previous price. The sellers increase supply and law of supply does not operate. It is also assumed that there is no change in climatic situation. For example, at any place flood or earth quake occurred. The supply of goods decreases at that place at previously prevailing price. If the prices of substitutes of a commodity fall then the tendency of consumers diverts to substitutes therefore, the supply of a commodity falls without any change in price. If the quantity of natural resources (minerals, gas, coal, oil etc) increases, the cost of production decreases. It causes to increase in quantity supplied. The capital goods are raw material, machinery, tools etc. The cost of production increases due to increase in prices of capital goods. It can lead to decrease in quantity supplied. The amount of investment is affected by the change in political situation of a country. The production of goods decreases due to decrease in investment. It is also assumed that the taxation policy of government does not change. The increase in taxes effects the investment and production and supply of goods decreases. Where c and d are parameters while P and Qs are independent and dependent variables, respectively. The positive sign represents direct relationship between P and Qs. By assuming different values of P, we can calculate the different values of Qs as shown below. As we assumed the different values of 'P' from zero to 5, then the calculated values of Qs increases from - 2 to 8. The quantity supplied is expressed on X-axis while price is measured on Y-axis. 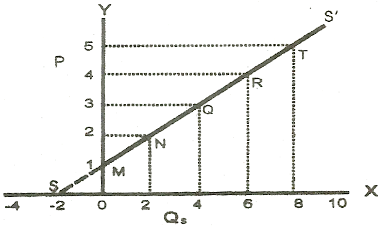 The law of supply can be illustrated through the supply schedule as shown in the above supply curve SS'. By plotting the various combinations of price and quantity supplied, we get different points S, M, N, Q, R and T. by joining these points, we get our desired supply curve SS', having positive slope as shown in the above figure. Following are the causes of positive slope of supply curve. When the price of a commodity increases, the seller increases the quantity supplied. The profit of seller increases and the aim of seller is to profit maximization. The cost of production increases due to increase in quantity supplied. It is necessary to increases price to maintain or increase the level of profit. Therefore, there is a direct relationship between price and quantity supplied. If there is a tendency of increasing prices at present period, the sellers increase quantity supplied for the lust of profit. It may be expectations in future to decrease prices. Now they want to maximize their profit due to good present circumstances.